With 13 Zonta districts spread across the United States, US Zontians were eager to find a way to join forces to advocate more powerfully at the national level. After the success of the first Zonta Advocacy Day on Capitol Hill in June 2017, a group of US Zontians prepared a proposal for a Zonta USA Caucus, which was approved by the Zonta International Board in November 2017. The Zonta USA Caucus unites all Zonta clubs and districts in the USA to support Zonta International’s mission to empower women and girls through service and advocacy. Working under the direction of the International Advocacy Committee and with a representative from each US district, the Caucus is a platform for advocacy actions within the United States. 4. Take action in support of, or in opposition to, proposed or enacted legislation and executive orders and regulations, implemented by the executive branch of government that directly or indirectly impact the lives of women and girls. 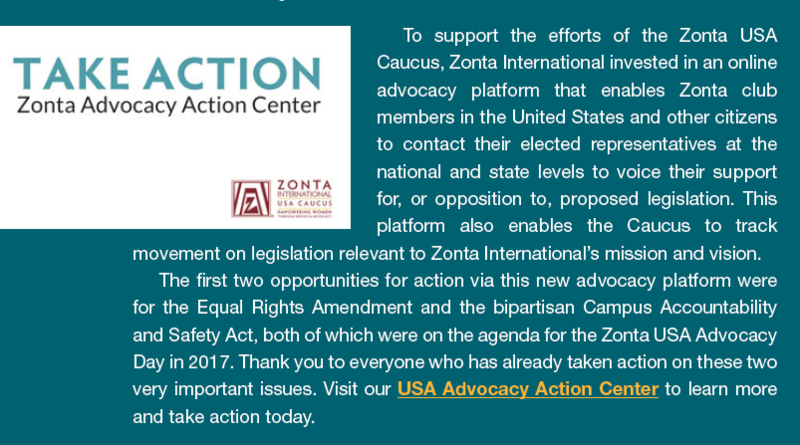 To support the efforts of the Zonta USA Caucus, Zonta International invested in an online advocacy platform that enables Zonta club members in the United States and other citizens to contact their elected representatives at the national and state levels to voice their support for, or opposition to, proposed legislation. 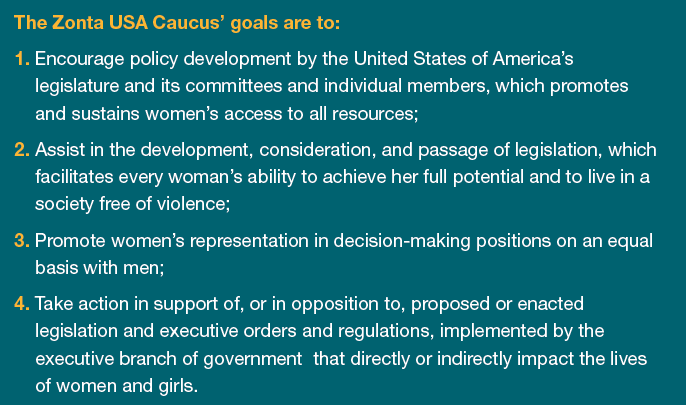 This platform also enables the Caucus to track movement on legislation relevant to Zonta International’s mission and vision. The first two opportunities for action via this new advocacy platform were for the Equal Rights Amendment and the bipartisan Campus Accountability and Safety Act, both of which were on the agenda for the Zonta USA Advocacy Day in 2017. Thank you to everyone who has already taken action on these two very important issues. Visit our USA Advocacy Action Center to learn more and take action today.